Sipping some hot, aromatic coffee on Christmas morning is one of the best feelings in the world. Wrapped in your favorite blanket, with your family at your side and the presents waiting to be unwrapped, one just needs a good cup of coffee to complete the festive, cozy feeling. If you happen also to have a stylish mug in which to savor your favorite coffee, that feeling is certainly amped up a notch. Below, we have some selections for you. This tall ceramic mug is perfect not only for traveling, but also for use when you’re at home. It comes with a lid that’s spill-proof, and that has a silicone ring, to keep drinks warm or cold. Made of a ceramic body with plastic elements, it boasts lead-free components and is safe for using in a microwave, dishwasher or an oven. It can hold up to 17 ounces and is the most significant choice for a mug that is eco-friendly and can be reused. 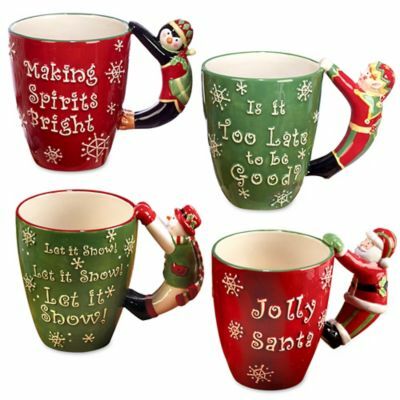 Therefore, beautify your Christmas holidays with a cool designed mug for coffee, tea or hot chocolate. 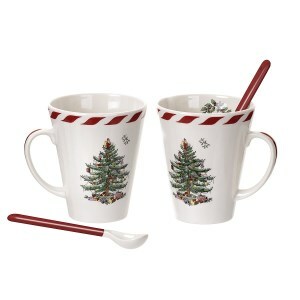 Looking for a pair of festive Christmas mugs? These beauties are made out of porcelain, being able to hold up to 14 oz., while the spoons are 6.75 inches in length. All of them have a lively and inspired Peppermint border, complete with the traditional Christmas tree design. A sign of quality and care in making the product is also the possibility to heat the drinks by placing the mugs in the microwave and put them in the dishwasher without care after use. Add this to the beautiful gift boxing you get them in and you know they’re a must! 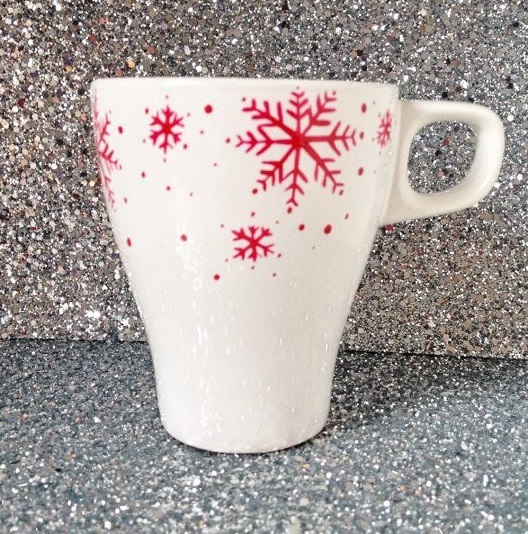 Another beautifully designed cup is this snowflake themed product. It is made out of borosilicate glass in a double-walled design, a material that is environmentally safe, sturdy and lightweight at the same time. That means that your scolding hot beverage won’t burn your hands or create condensation on the cup. As any quality made cup, it is safe to place in the dishwasher and the microwave. The product also features a multi-firing process of both interior and exterior designs, that create a 3D effect. It can hold up to 12 ounces and comes packaged in a beautifully designed gift box. For the people who are more on the traditional side, this barrel-shaped ceramic mug is handmade in Poland and can quickly become your ideal companion when it comes to beverages during the cold season. The drawings and motifs are really detailed and beautifully executed: a moose, pine trees, and snowflakes, on top of a theme composed of Christmas tree wreaths. Beside being dishwasher and microwave friendly, the mug can also be stored in the freezer. It can hold up to 16 oz., its dimensions being 3.75 inches in length, 4.75 inches in width and 4.25 inches in height. Buy it now! A fitting mug for those who like funny and bright things, it is also made out of 100% pure white ceramic. 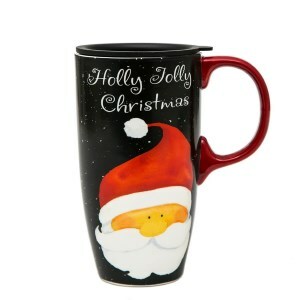 It can hold a large amount of liquid, and it is printed on both sides, in vivid and clear colors, depicting Father Christmas in a goofy and sweet design. The product can be safely used in the dishwasher and the microwave, as well. It features a large handle and can store hot and cold drinks with no problems. Its design and capabilities make it a perfect gift for others or yourself during the Christmas season. Bottoms up! 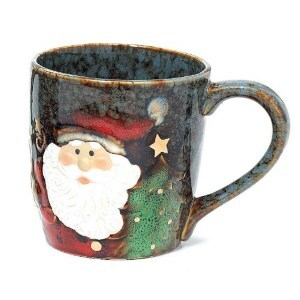 In true Christmas spirit, this cup is superbly thought out, from design to material and usability. The color palette features ceramic blue and marbleized brown, shades and nuances that are beautifully merged with the porcelain of the cup. The frontal side depicts Santa Claus in a slightly raised form. As to capacity, it can hold up to 18 oz. of beverage, be it hot or cold. Of course, the cup is safe for use in a dishwasher or a microwave. Its handle permits easy maneuvering, reducing the risk of unwanted accidents. Also, the product comes with a gift box. Enjoy! Now here’s a fancy and classy cup! 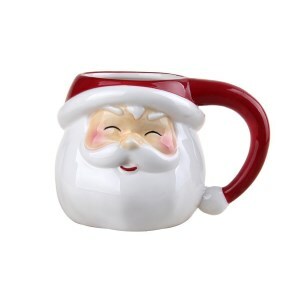 Funnily designed to depict Santa’s face (the cup) and hand (the holder), it features a beautiful shade of red, which combines gracefully with the snowy white, making it an original choice for a holiday cup. The product measures 5.51 inches in length, 3.93 inches in width and 3.74 inches in height, being made out of 100% hand painted ceramic. Each piece comes wrapped in polyfoam and is safely packed so that it can reach your mailbox with no incident. Also worthy of note is that this beautiful cup is perfectly dishwasher safe. Traveling for the holidays? Then this porcelain, lead-free ceramic cup is for you, undoubtedly. Holding up to 17 ounces of beverages, it is entirely microwave and dishwasher safe, and it comes packaged in a box that’s drop resistant. With it being designed with travel in mind, it also features a black lid that seals impeccably, ensuring the keeping of your favorite beverages hot or cold. 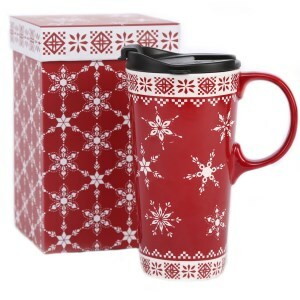 The cup is also beautifully printed on both sides with several types of snowflake patterns, in accordance with the Christmas spirit and celebrations. It comes in red and blue, with an ergonomic and sturdy handle. Our final choice for this list is a cup/mug accessory, because yes, you can have and need that as well. We believe that this elegant and discreet sleeve is an excellent option for wrapping up your drink and keeping it warm. Handmade and eco-friendly, the sleeve comes in a beautiful shade of red, with two little-crossed candy canes in the top right position. Carrying your cup around in style has never been more appropriate with this sleeve. 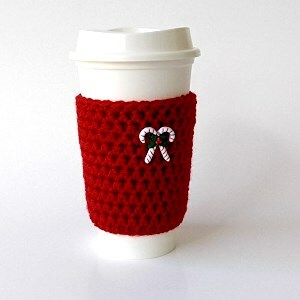 Made of 100% acrylic yarn, it fits 12 to 20 ounces to-go cups, measuring approximately 4 inches in height. Spoil yourself! Let’s face it – Christmas is almost everyone’s happiest holiday of the year. It is the most festive time, filled with joy, laughter, snow, Santa, and, of course, presents. And while you still may have to wait a few months before buying the Christmas tree and sing carols again, there is no reason why you shouldn’t get a little bit ahead of yourself. At least with some accessories. Sure, it may not be fun to work in a store where Christmas presents and accessories are sold the entire year, but why not enjoy at least some of winter’s perks in mid summer if you would wish to? Finding the perfect Christmas present is not an easy task, but with so many months ahead of you, we are sure you will make the greatest choice. And if you are running out of cool ideas on a budget, we can suggest you the eternal coffee mug, all dressed up in Christmas clothes. 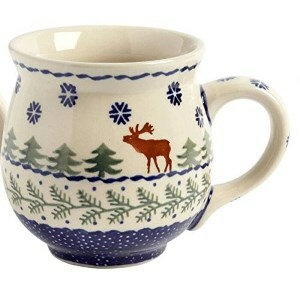 However, if you do decide to pick up a mug as a gift for Christmas, you might find it difficult to go through the countless patterns, shapes, sizes, and designs. Luckily for you, we have come up with a comprehensive buying guide to help you make the right choice when it comes to coffee mugs. Right from the beginning, we need to say that we are to be held responsible for the great array of choices you may find in the following lines. We love mugs, we love Christmas, and we most certainly love coffee. If you are a caffeine lover, you will most certainly search for the largest cup to pour your morning liquor in. However, you need to understand the importance of finding the right size for you. Depending on how you drink your coffee in the morning, you may require a larger cup or a medium-sized cup. Although morning coffee might seem like the most precious moment of the day, excessive caffeine will not do your health any good. In order to minimize your daily coffee intake, we suggest you opt for smaller mugs. On the other side, if you love to sprinkle your coffee with all sorts of seasonal flavors, milk, honey, or sugar, you are allowed to use a larger-sized mug. Just make sure that, no matter how big your mug is, you will keep the same amount of coffee as on a regular mug. No need to fill it up! Another important aspect to take into account when looking for a great coffee mug is its material. Most coffee mugs are made out of porcelain, glass or ceramics, but their quality strongly differs from one manufacturer to another. No matter your choice for the material, bear in mind that it will have to be heat resistant. Nobody wants their coffee cold, especially not on a winter morning, so you need to be able to easily hit your drink into the microwave. You will also have to consider the design elements of the mug. There are countless styles of coffee mugs on the market, but in order to preserve your favorite one over the years, you need to take good care of it. Thus, it is not only important to search for the right durable materials but also look after all embellishments or accessories your coffee mug might have. Search for those which are 100% safe to be used in microwaves or dishwasher machines. All adjacent beams, embellishments or handles must also be heat and water resistant. When it comes to designs, there is no limit to what human imagination can come up with, especially regarding Christmas-related accessories. Coffee mugs are no exception, thus finding the perfect one may seem almost like an impossible task. In order to make sure you picked the right design, first of all you need to have the user’s behavior in your mind. Are you going to use the mug yourself? Are you going to give it to a close friend, relative, or just a co-worker for Secret Santa? We suggest you pick the right design of the mug according to the user’s personality profile. Corporate friends and work colleagues will mainly be satisfied with a kind reminder that Christmas is approaching, so you need to choose a coffee mug with season-appropriate colors. Small, painted designs could be a nice finishing touch, but we suggest you keep a somewhat professional line and choose stronger colors, such as green or red. Stay away from funny images or quotes if you don’t know the person too well. On the other hand, closer friends and family members call for the most amazing coffee mug design in the store. Let your imagination run wild and choose beautifully painted Christmas images, funny seasonal quotes, cute reindeer, white snowmen or snowflakes, fluffy Santas, and delicious gingerbreads. A cool choice would be a thermic mug, the ones that display a certain image, text or color when they’re full of a warm liquid and another one when they are empty or cold. For the most precious friends or family members, you can definitely choose a more refined product, made from exquisite materials and even less conventional ones. 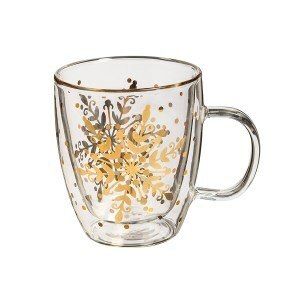 Girls will certainly enjoy a sparkled coffee mug in gold, pink or silver to match the festive mood of the month. On the other side, if you want to treat your boyfriend like the king he is, you might as well start with a luxurious coffee mug with a red velvet finish. 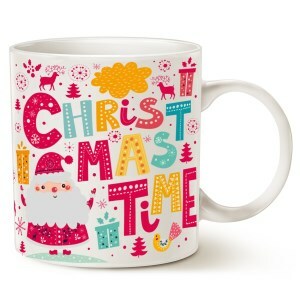 Other special designs include reindeer horns or carrot noses attached to the mug to make the product look funnier and more appealing to people of all ages. However, one thing is for sure – no matter what type of design you choose, it will almost be impossible to stick to just one mug.